↑ Podsiadlowski, Ph. et al. (2004). 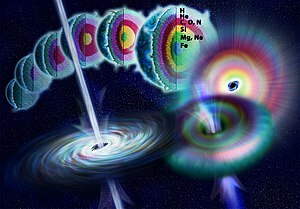 "The Rates of Hypernovae and Gamma-Ray Bursts: Implications for Their Progenitors". Astrophysical Journal 607L: 17P. doi:10.1086/421347. ↑ Melott, A. L., et al. (2004). "Did a gamma-ray burst initiate the late Ordovician mass extinction?". International Journal of Astrobiology 3: 55–61. doi:10.1017/S1473550404001910. ↑ Hurley, K. (2003). "A Gamma-Ray Burst Bibliography, 1973–2001" (PDF). In G. R. Ricker and R. K. Vanderspek. Gamma-Ray Burst and Afterglow Astronomy, 2001: A Workshop Celebrating the First Year of the HETE Mission. American Institute of Physics. pp. 153–155. ISBN 0-7354-0122-5. สืบค้นเมื่อ 2009-03-12. หน้านี้แก้ไขล่าสุดเมื่อวันที่ 5 พฤศจิกายน 2560 เวลา 10:39 น.